A recent online study shows that consumers consider Blu-ray/DVD combo titles an exceptional value. Lieberman Research Worldwide shows that 77% of consumers polled think a Blu-ray/DVD Combo pack is a much better bargain than an individual Blu-ray or DVD. 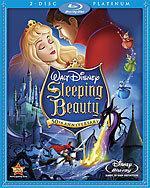 The first title that received this treatment was 'Sleeping Beauty' back in October.